But what is less well known is that Japanese women have the lowest rates of obesity (only 2.9%) in modern cultures. In Japanese Women Don’t Get Old or Fat author Naomi Moriyama shares with readers the basic elements of the Japanese approach to eating stating that her book is “not a diet plan but a whole new way of falling in love with food”. The emphasis is on small portions of fresh seasonal food. Dieters are advised to value quality over quantity and to eat slowly so as to appreciate the flavors of the food and reach a feeling of satisfaction with less food. A major factor of the Japanese way of eating is to eat until 80% full. In addition a great deal of emphasis is placed on presentation and making the food look beautiful and appealing to the eye. Dairy and bread are not part of the diet and when beef and chicken are included in meals they are regarded more as condiments rather than the main focus of the meal. Fresh fruit is the preferred dessert however if a richer dessert is eaten it is in very small quantities. In Japan breakfast is considered the most important meal of the day and is often the largest. Moriyama introduces dieters to the concept of the Japanese power breakfast, which consists of miso soup, rice, egg or fish, vegetables, fruit and green tea. Fish such as salmon and mackerel. Vegetables including daikon radish and sea vegetables. Soy (tofu, miso, soy sauce, endamame). Noodles (soba, udon, ramen, somen). Fruit such as Fuji apples, tangerines, and persimmons. Look for more Asian inspired recipes here. The Japanese Diet conveys to dieters that it is not enough to eat like a Japanese woman but it is necessary to adopt similar lifestyle habits. The Japanese achieve a lot of physical activity by simple actions such as walking, climbing stairs and using a bicycle to run errands rather than relying on motorized transport. 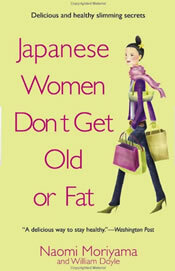 Japanese Women Don’t Get Old or Fat retails at $13.00. There may be an increased cost for groceries and equipment for food preparation especially in the initial stages of the diet. Encourages freshly prepared meals based on whole foods. Provides clear instructions on how to prepare the Japanese foods that are the foundation of the diet. Encourages a balanced breakfast every day, which will reduce the likelihood of cravings or overeating later in the day. Good for dieters who like to experiment with different flavors and cuisines. Very restrictive. Some dieters may be intimidated by the prospect of such a dramatic change in dietary style compared to a Western diet. Will require more time to be spent on meal preparation. May be difficult to obtain all the recommended ingredients. Lacking specific guidelines for meal planning. Need to watch portion sizes. Difficult to follow for those who are on a sodium restricted diet. Largely addressed towards women even though the plan is suitable for men as well. This is a healthy and balanced approach to eating particularly if brown rice is selected as the major source of complex carbohydrates in the diet and if generous portions of vegetables and fruit are included in the daily diet. However, it is important to be aware that there is no magic to Japanese foods and if dieters are to be successful it will be necessary to pay attention to portion sizes and limit calorie rich foods in the diet. I would eat a really small bowl with rice to dinner! I hate exercise cause I dont want to have a big body haha! I just want a cute body! How much should I exercise? Simple. Eat everything and walk the Apalachean trail. Fat is not about food, is about unbalanced life. Exercise in Western countries: People try to burn the excessive holiday intake, or lose weight, or fight the weight gaining or dont get fat.They Count calories because there is a great lack of exercise. Eastern countries: Enjoy food as a whole, including decoration, plates, bowls, and enviroment. Exercises are part of the normal life. Blood flowing and balanced life. There is no point to count extra calories. I know the Japanese diet is one of the best as what the post said! Within our website we have varied Japanese diets and their habits. regards! I don’t believe in “Diets”, but I do believe in Transformation. Afterall, a butterfly doesn’t go back to its Crysallis, does it? Once one receives facts and truth about anything, including nutrition, we either receive or reject it. Regardless of its validity and value. When we receive it, we apply it into our daily lives. Reject it and we suffer the concequences. The facts is: Japan is healthier than America. We MUST learn from what they’ve known for centuries! This book is an excellent resource! won’t eating rice breakfast lunch & dinner make you gain weight faster ?? It would depend on how much rice you are eating. Just “eating” anything will not cause weight gain. Grains such as rice are an essential staple to the everyday diet. In fact, the right amount of carbohydrates are needed to keep us full enough that we won’t crave those extra goodies throughout the day that cause us to gain weight. You will only gain weight if you eat more than your body uses up in a day. Also, fatty and processed foods (which rice is not) no matter if consumed in a “small helping” will not aid in any sort of diet. The real secret to weight loss is not eating any carbs or eating less food, but PORTION SIZES and knowing WHAT you are eating. Idea 1: Figure out how much you normally eat, then during your next meal measure out about 80% of the food you normally would. -eat slowly…enjoy the food and make sure you chew enough times. You will feel full sooner than usual. Idea 2: Eat two helpings at a meal. The first helping is 50% of what you normally would eat, and the second helping is a bit smaller. I just spent three weeks in Japan, ate very well (and often),and magically lost seven pounds. I wasn’t trying. I ate sweets everyday. The food is just not heavy in oil, and it is higher in water content,which made me feel very satisfied without tons of food. Of course, getting tofu that has such a great flavor and such fresh veggies could be challenging here. I think alot of people don’t know exactly what it feels like to be 80% full. I know that I’m use to eating until I’m full, not necessarily totally stuffed, but full. I’m still trying to master the art of eating less and accepting that I will not feel totally full. I think that’s the one major problem with this type of diet. How do you know if you are 80% full and know to stop eating? I’m going to fold japanese food into my diet after I’ve been on an elimation diet. I’m allergic to something and I have to figure that out first. im a certified filipino and i want to taste those hell cuisines,,,,,!!! is japanese food delicious?? ?i don think so…. Just to let you know, especially i if you are in the US, Canada, or the UK, the Japanese food you find in most restaurants and/or grocery store, is nothing like real Japanese home cooking. Most of what is served as just food outside of Japan is westernized versions of Japanese street food… Real Japanese home cooking, what they eat everyday, is much different and way better. Harahachibunme is a saying from the island of Okinawa which roughly translates to 80%. The premise being as you reach the point of being 80% full you should curtail your eating because you most likely will soon be 100% full when your brain catches up to your stomach again. Japanese meals are not any longer to prepare unless you compare them to microwave meals, and frozen dinners. This should not be listed as a con as I believe it to be irrelevant and potentially incorrect about the diet. It can be difficult in many countries to get the foods traditionally served at Japanese meals but there are likely substitutions that could be made.